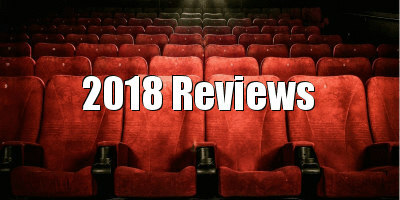 There's an argument to be made against novelists adapting their own work for the screen, the thinking being that they are too in love with their words and don't understand how to turn those words into images in the manner of a conventional screenwriter; or they may struggle to trim down their work to fit a two hour running time, devoting too much time to unnecessary subplots at the expense of the main narrative. If ever an example backed up that argument it's Ian McEwan's adaptation of his 2007 novel, On Chesil Beach, directed here by Dominic Cooke, a veteran theatre director who seems to know as little about the craft of screen storytelling as McEwan. Only the enthralling central performances of Saoirse Ronan and Billy Howle prevent their film from becoming a contender for 'worst of 2018' lists. Ronan and Howle play Florence and Edward, whom we meet at the titular resort the afternoon following their wedding. It's 1962, a year before the first albums from The Beatles and The Rolling Stones would drop and change the fabric of British society forever; young men still wear shirts and ties to dinner and women won't be caught dead in mini-skirts. Florence and Edward appear to have chosen the most unromantic hotel in England for their first night as newlyweds, served a dry, unappetising meal of roast beef and veg by a pair of comic relief waiters who sneakily top up their spilled wine bottle with water. After their meal, the young couple kick around the idea of consummating their marriage. Virgin Edward is nervous but enthusiastic, but his bride seems particularly reluctant to engage in physical passion with her new husband. Through flashbacks, we witness the courtship and blossoming of their relationship, and a dark detail of Florence's past is revealed. 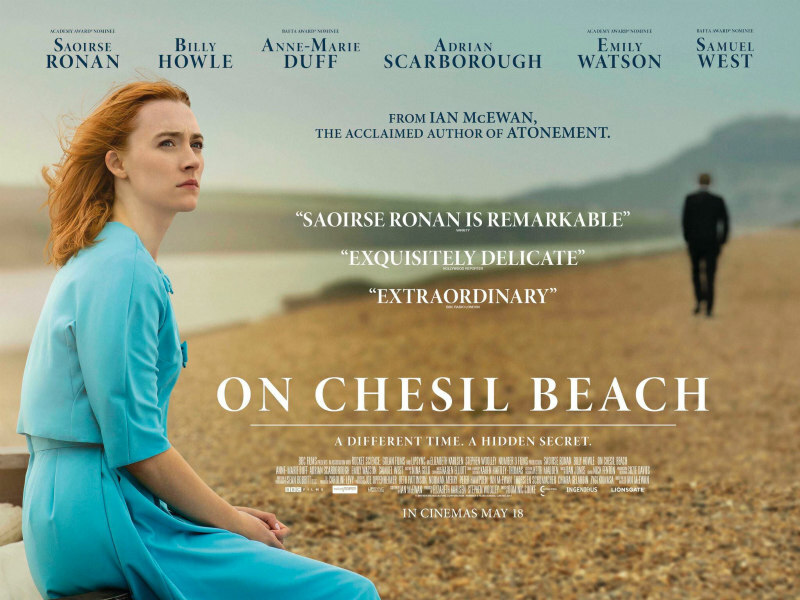 The revelation of said detail arrives during what should really be the inciting incident of the drama, but which here comes at least 80 minutes into the movie, casting a giant shadow on the middlebrow hijinks On Chesil Beach has offered up to that point. It's a revelation that paints a supporting character as something of a monster, yet it's followed by a scene involving the character in question losing his rag during a tennis match, as if equating being a sore loser at sport with the despicable and taboo act the film suggests he's responsible for committing. This moment is indicative of the sloppiness of McEwan and Cooke's storytelling, with wildly differing scenes placed together to create a jacknifing of tone. Much of the drama plays out like a light comedy from the era the film takes place in, Doctor at Large with a bit of modern class commentary thrown in, while the bedroom awkwardness wouldn't be out of place in a Carry On movie. Even its darker moments are shot as though to elicit laughs, such as the revelation of how Edward's mother became brain damaged, or a flashback demonstrating how improbable tough guy Edward defended the honour of the most stereotypical Jewish geek this side of Robert Carradine in Revenge of the Nerds. 'Show, don't tell' are three words of advice McEwan and Cooke show a disdain for here, their film's protagonists telling a lot through words that could have easily been conveyed through images. On their first date, Florence tells Edward how instantly attracted she was to him, going into detail about his scruffy hair, the patch on his trouser leg et al, yet we witnessed their first encounter earlier and Cooke's camera failed to convey any such detail as he settled for a pair of medium closeups and denied us Florence's perspective. Things progress from lazy and uninventive to downright tacky in the final act when we flash forward to a version of 1975 that seems to take the goofy Hammer movie Dracula A.D. 1972 as its visual reference point, and then on to 2007 where Ronan and Howle are forced to wear some laughably unconvincing old age make-up. On Chesil Beach's biggest crime however is that despite the commitment of its young stars, it never convinces us that we're watching two real people in a genuine relationship, and the pivotal action the drama hangs on is such a grand and foolish gesture that it's simply impossible to swallow. Florence and Edward clearly aren't a suitable couple, and on the evidence of this collaboration, neither are McEwan and Cooke. On Chesil Beach is on Netflix UK now.